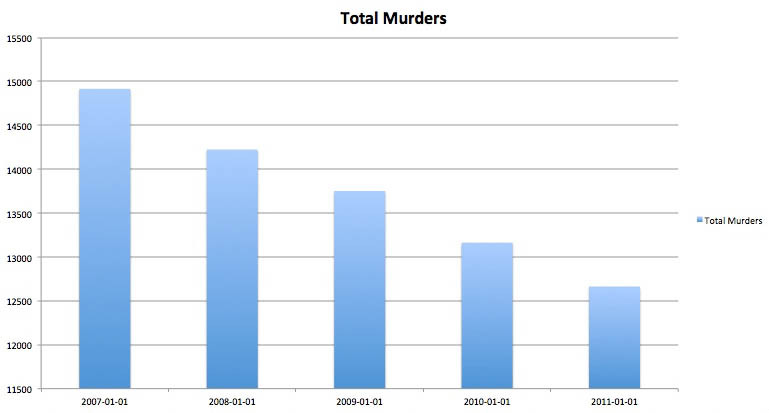 Dramatically drop in the numbers of murders in the U.S. The number of U.S. homicides has been falling for two decades, even though the number of guns has been growing every year. Numbers from the FBI shows that there have been over 15% fewer murders by weapon from 2007 to 2011 in The United States. In 2007 the number of murders by weapons was 14.916 and in 2011 the same number was 12.664. But there hasn’t been any more gun control in the same period of time – and therefor experts find it hard to explain, why we see this positive development. Professor at New York University and specialist in criminal law James B. Jacobs says that nobody can answer the question with one hundred percent certainty. Political commentator and President of the Crime Prevention Research Center, John Richard Lott agrees that the police play an important role in the lack of gun control. “There are two main factors for why we see such a dramatic decrease in the numbers of murders by weapons. The first is the police. The police have improved a lot in the last decades. But the most important factor is that more people are getting guns legally. And especially more and more women are getting private guns. That means that the criminals never know, if the one they want to attack have a gun on them – so they might think twice before they try to murder someone” – he explains. 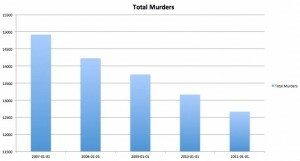 In several polls we see that the American people believe that the number of murders are increasing – even though the opposite is actually the case. Professor James B. Jacobs blames the media for this misunderstanding. “They are not good enough to tell the positive developments – even though the gun violence is the lowest in 40 years. But despite the decreasing numbers of murders and increasing amount of weapons – research shows that where there are more guns there are more homicides. According to a report from The Harvard University – researchers proved through data from 26 developed countries, that where there are more guns available, both men and women are at higher risk for homicide and in particular firearm homicide. “Every year the amount of guns in the U.S. continues to grow, and every year the gun violence continues to drop. The discussion about how gun control may or may not affect the gun violence in a positive way – is a very difficult discussion. Because our logic tell us that of course there will be less violence with less guns, but at the same time we can see, that the amount of guns are increasing and the violence is decreasing – so there is no simple answer to the discussion” he says. According to The Guardian, the Americans have become more and more against gun control in the last decade. In 2004, 37 percent of the American people wanted to protect their gun rights, where 58 percent wanted more gun control. These numbers have changed dramatically over ten years – and in 2014, which is the newest numbers, 52 percent of the population wants to protect their gun rights and only 46 percent wants more gun control. And President of the Crime Prevention Research Center, John Richard Lott understands that development in the opinion of the American people. “Gun control has become even more free in the last decades. It is easier than ever to get a gun. In ten states you don’t even need a permit to get a gun anymore – and that might make the criminals afraid. And the population understands that” he says.